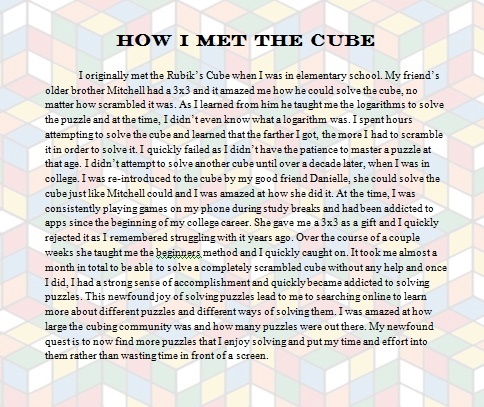 I originally met the Rubik’s Cube when I was in elementary school. My friend’s older brother Mitchell had a 3×3 and it amazed me how he could solve the cube, no matter how scrambled it was. As I learned from him he taught me the logarithms to solve the puzzle and at the time, I didn’t even know what a logarithm was. I spent hours attempting to solve the cube and learned that the farther I got, the more I had to scramble it in order to solve it. I quickly failed as I didn’t have the patience to master a puzzle at that age. I didn’t attempt to solve another cube until over a decade later, when I was in college. I was re-introduced to the cube by my good friend Danielle, she could solve the cube just like Mitchell could and I was amazed at how she did it. At the time, I was consistently playing games on my phone during study breaks and had been addicted to apps since the beginning of my college career. She gave me a 3×3 as a gift and I quickly rejected it as I remembered struggling with it years ago. Over the course of a couple weeks she taught me the beginners method and I quickly caught on. It took me almost a month in total to be able to solve a completely scrambled cube without any help and once I did, I had a strong sense of accomplishment and quickly became addicted to solving puzzles. This newfound joy of solving puzzles lead to me to searching online to learn more about different puzzles and different ways of solving them. I was amazed at how large the cubing community was and how many puzzles were out there. My newfound quest is to now find more puzzles that I enjoy solving and put my time and effort into them rather than wasting time in front of a screen.